You know you’re a theatre nerd when you – somehow - don’t cry during your wedding vows, but you cry at the Globe Theatre in London four days later on your honeymoon. A full house on July 31, 2013. A Midsummer's Dream come true! 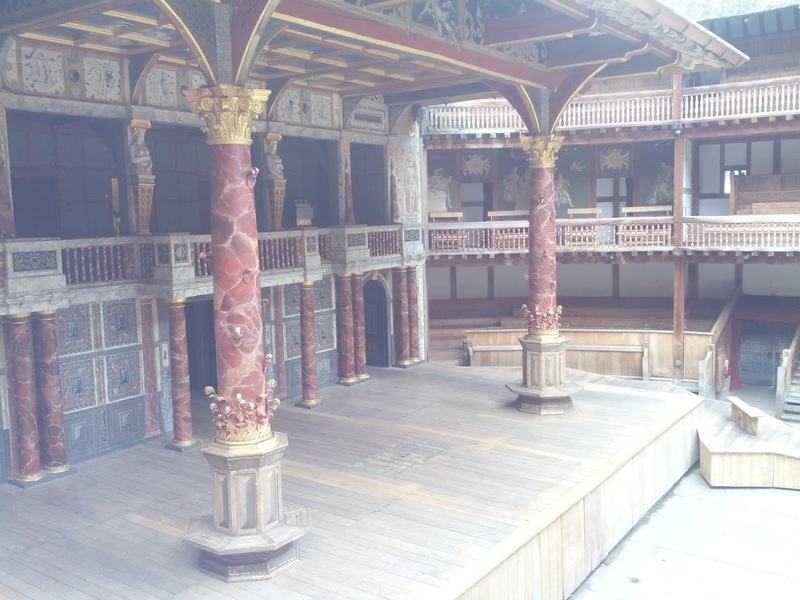 Maybe it was partly the jet-lag, but when my husband and I sat down in the upper gallery of Shakespeare's Globe, on July 31 2013, to see a performance of A Midsummer Night’s Dream, one of my theatre dreams came true and I can’t deny being very “moved”. To say it was wonderful would be a huge understatement. Before we took our seats, we saw the stones engraved with names of donors to the theatre and prominent actors who regularly perform in plays by The Bard; seeing Sir Patrick Stewart’s was a very special thrill for many nerd-related reasons. Excited Theatre Nerd or Trekkie? You decide. Fast-forward a few years into the future and now we’re living in Europe, only 3 hours by Eurostar away from London and I’ve had the opportunity to not only take dance class in London (and make some of my dance dreams come true), but I’ve been able to see some incredible shows on the West End stage AND revisit my beloved Globe for a special tour. No performances were taking place on that day last spring, so we got to tour the galleries and the ‘pit’ where the ‘groundlings’ stood, and still stand, to watch shows today. Prior to meeting the rest of the group in the lobby area, we also took in a detailed exhibit of the history of the Globe, as well as some of the beautiful costumes and props from recent productions. Alas, no nerdy tears were shed during this excursion. But it was still exciting to be in the theatre with only 60 other people when it can hold up to 1,600 when it’s sold out. 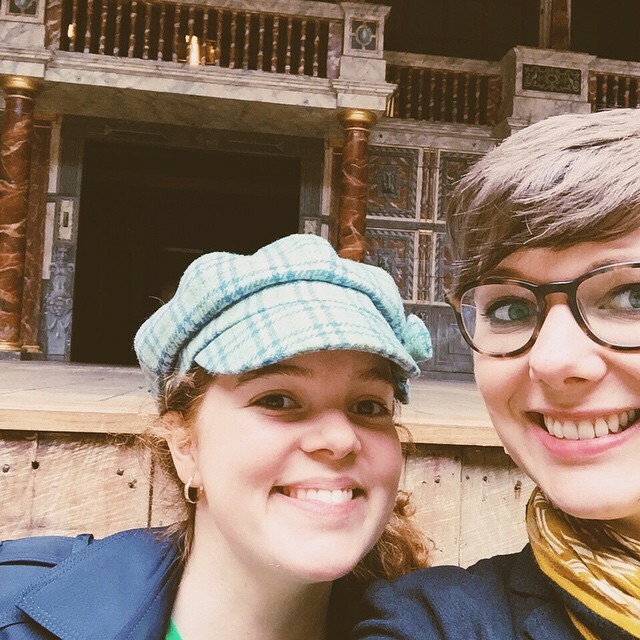 I was with my friend Laura, who was finishing up her PhD at Oxford so I was in good, nerdy company with someone who not only understood, but appreciated my special brand of theatre fangirl-ism. She took some fantastic photos of me and the two of us together right by the stage and we both enjoyed our tour guide’s dry sense of humor and knowledgeable quips. *The Globe as it currently stands, is not where the original theatre was but it’s very close – only 750 feet from the original site. *A group of actors from a rival theatre went to every performance of Hamlet, memorized as much of it as they could, wrote it down and performed it later in their theatre. Since this would be the Elizabethan era’s version of recording a film on your cellphone and uploading it to YouTube, can you take a guess at the quality level? That version, apparently published as the ‘Bad Quarto’, is according to our guide, “laughably terrible”. *There are also Bad Quartos of other Shakespeare plays, such as Romeo and Juliet, Henry V, and The Merry Wives of Windsor, as well as another play attributed to Shakespeare called The Merry Devil of Edmonton. 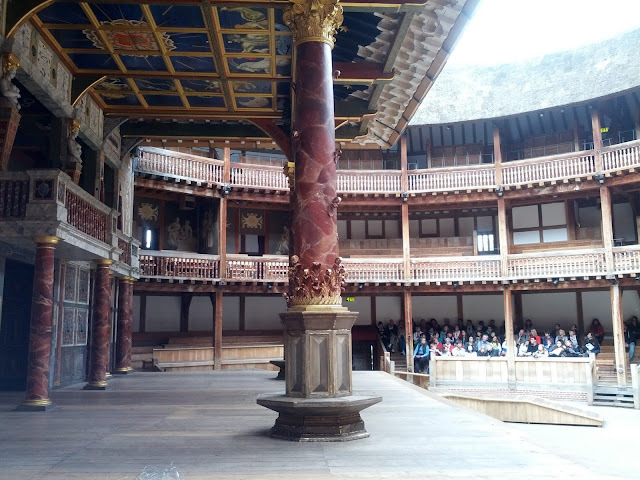 *The original Globe burned down in 1613 when the actors performing Henry VIII “thought it would be a cool idea to fire a canon inside a wooden building with a thatched roof”. This is a near-direct quote from our guide. 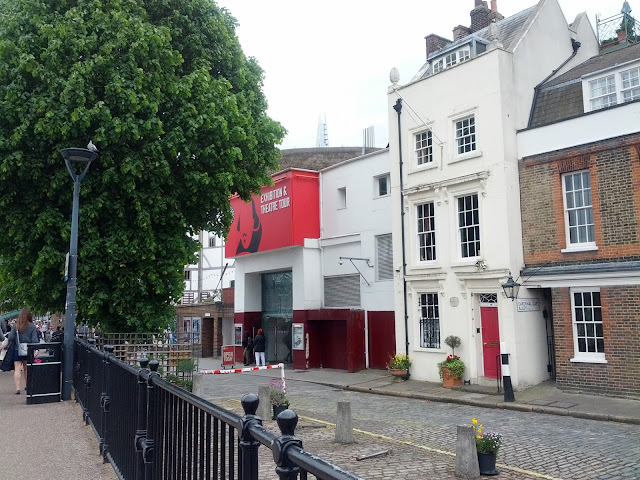 The theatre was, however, rebuilt only a year later. I genuinely enjoyed the tour, especially getting to be so close to where the magic happens. But I couldn’t help wanting a bit more – like the chance to go onstage and then backstage and up to the balcony where the musicians perform. I understand it’s probably too difficult to do that during the performance season, but still, one can hope. 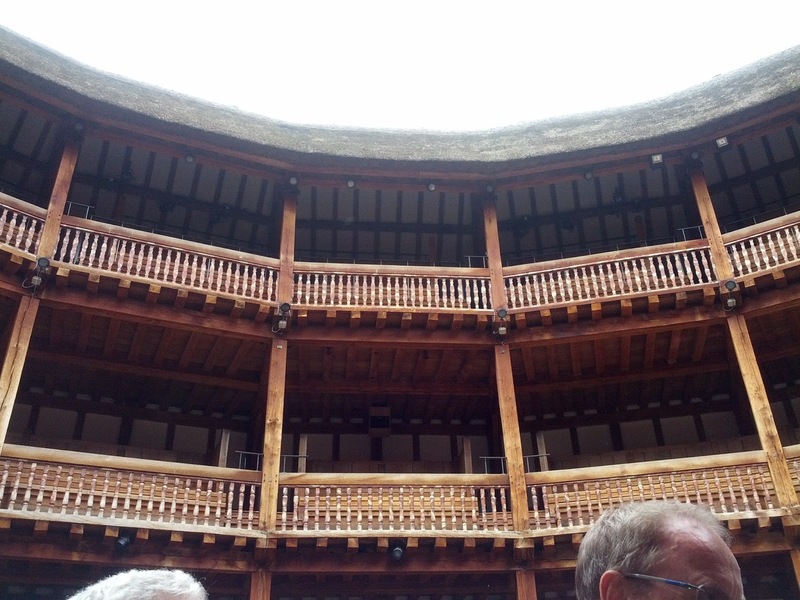 Maybe next time, I’ll get the chance to ‘tread the boards’ of the mighty Globe Theatre and say a few lines of text…but from which play? The prologue from Romeo and Juliet? Puck’s epilogue from Midsummer? The monologue of Juliet taking the sleeping potion that got me the highest mark and a standing ovation at theatre school back in 2003? Words, words, words – which ones will I dare speak? 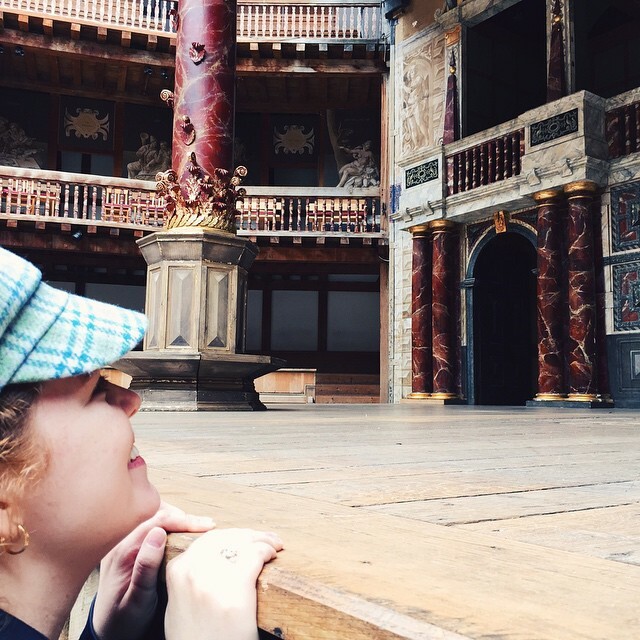 Let’s be real though – if, no - when I get the chance to stand centre stage at the Globe, I know I will first and foremost be too overcome to speak and cry big, theatre-nerd tears before I can pull it together and deliver. As Puck would say: What fools these mortals be! Happy World Theatre Day 2016 and go see a play!